A great photograph of a locomotive (Engine No. 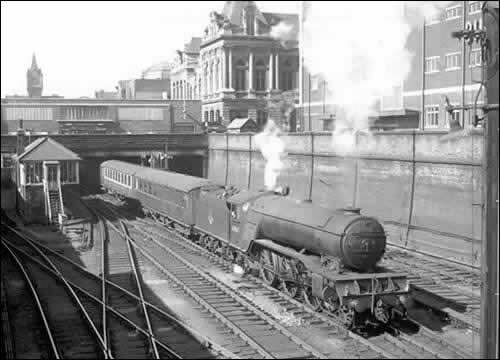 60962) in Sunderland Central Station, taken on the 18th May 1959. Sent in by © Allan Edwards. 2-6-2 V2 Express out of Sunderland c1957, Class V2 Gresleys "Green Arrow" class introduced 1936 for Mixed Traffic but mainly used on express trains. 6'2" wheels, 3 cylinders. Except for 60800, now preserved as LNER 4771 "Green Arrow" V2. (60800-60983) were withdrawn between 1962 and 1966.